So, we don't think we have introduced you to Milo, he's the black lurcher on the left. We have had Milo about three months now and he is settling in well. We found Milo at The Forever Hounds Trust, an amazing rescue centre for mostly greyhounds and lurchers some of whom are from a racing background. Milo is 9 months old and is into everything as most puppies are! He has made great friends with our existing dog, Murphy, ( from Forever Hounds too!) and is definitely keeping him on his toes. We have had some great adventures so far and we will keep you up to date with their doggie lives. Lots of clients we meet at markets, shows and events often ask about how the commission process works so today we share with you what we do. Firstly , we ask our clients to provide a good quality clear photo for us to work from. This is easier said than done. About 30% of our work is painting animals who have passed so we are often presented with very old , out of focus, and inside light photos. This is usually a very sensitive time for the client so we have to approach this part of the process very carefully. Once we have a photo to work from Andy will start the painting. We use very high quality water colour paper which is textured and 300gms thick. This allows Andy to get the paper quite wet without damaging it. We have to do a line drawing first and then usually build up the layers of paint approx. three times before the painting is finished. The client can then view the painting by email or by phone to make sure they are happy with the finished work. Sometimes clients want to frame the artwork themselves at this point but we can mount and frame for our customers too. The whole process takes roughly a week which equates to 10 hours at the table painting. We hope this gives you a little insight into what we do here at The Animal Artist HQ. If we can help with any commission process questions please give us a call. We are very excited to be part of this very popular and well attended Christmas Fayre at Nancledra School. We will be taking final orders for Christmas delivery so if you want a pet or animal portrait as a gift for a loved one please visit our stand at the fayre. There will be over 40 stalls selling homemade items along with plenty of food and mulled wine as you stroll around. We are heading up to Truro on Tuesday 4th October as Andy will be interviewed by Debbie McCrory during her 3pm show on Radio Cornwall! Andy will be taking about his life, his move down to Cornwall and everything to do with his passion of painting. If you are in the area listen out! At The Animal Artist HQ we have been asked recently to do a few pairs of dogs. 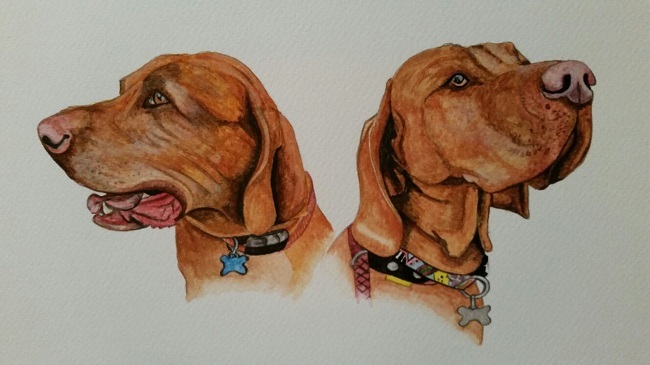 The Hugarian Vizslas and the Dobermanns below are just two that Andy has painted. There are another two or three in the pipeline! It shows us we really are a nation of animal lovers when we get two dogs as they are great company for one another. We are please to announce our participation in this years Countryman's Fair in the stunning grounds of Werrington Park Estate near Launceston. We will be showing examples of our dog and horse commissions and we will be on hand to help customers commission an original watercolour of their animal. We look forward to seeing you at the fair on Sunday 7th August from 9.30am. Welcome to our brand new website! We are so pleased to have a fresh and exciting new look to the site. Please take a tour around to see Andy's amazing artwork and limited edition prints. Andy's latest work is a Schnoodle ( a schnauzer and poodle cross). Let us know what you think ? We are very excited about our new collection of sea life cards. Available in John Dory, Crab, Sardines, Tiger Prawn and Lobster. We have printed some of these with some great filters which give each card a very unique look.